What makes this pair of cufflinks so unique is the cheerful association between red, tangerine and peaceful silver. 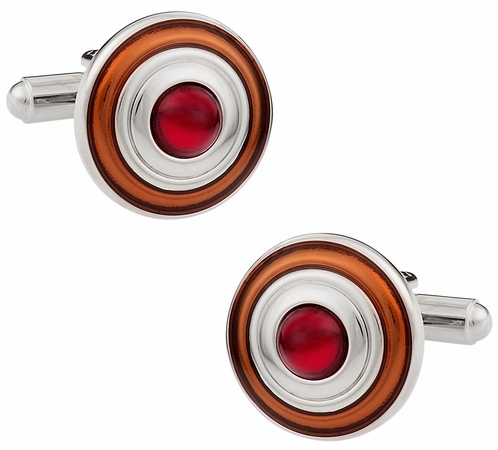 This trendy, round pair of cufflinks is described as a red dot surrounded by a ring of polished silver, the outside being a band in the bright colour of tangerine. Each 5/8� in diameter cufflink can be worn with your favourite French cuff shirt, adding both style and elegance, as well as a drop of dauntlessness to your appearance. The great product warranty which accompanies this pair of cufflinks is proof of their durability and shows our dedication to satisfy your needs. The colors in these cuff links look great. I love the way the orange compliments the red. It is amazing and I could wear these with any suit.